Dr Linden Hamidon was appointed to the Board of EPMB on 20 January 1997. 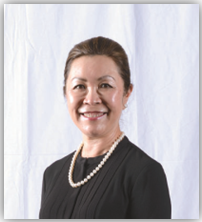 She holds a Bachelor of Dentistry Degree from the University of Adelaide, Australia and has been a practicing Dentist since 1979. Her spouse, Hamidon bin Abdullah and two sons, Johan bin Hamidon and Aidan Hamidon, are also Directors and major shareholder of the Company. She attended all five Board Meeting of the Company held during the financial year ended 31 December 2017.